3.3 million professionals consider their home to be their primary workplace, and in each of those homes, you’re likely to find an office where workers spend a minimum of 40 hours a week. Chances are, this office looks about the same as it did when it was first set up too. A new year is all about new beginnings, and it’s time to reinvest in your workspace again. We’re skipping cookie-cutter advice like “buy a plant” in favor of sharing tips for rethinking your furniture and its placement, paying attention to lighting, and adding a new scent to revitalize your office to better increase your productivity all throughout the year. A quick scroll through Pinterest will be the first to tell you this is wrong — what you really want is a tiny desk. However, a long desk offers up extra room to work on projects, set up calendars, space to include an additional computer screen or laptop, and store any other necessary items. Self-employed workers don’t want to be saddled with fluorescent lighting reminiscent of an office cubicle. Keep your mood up by taking your home lighting plan up a notch and considering the placement of where your lights should be in relation to your computer. Take advantage of natural lighting when you can but remember that during the winter months this light fades away quickly. Invest in a couple of desk lamps for a softer glow on darker days and evenings. This is always a good investment since you’ll spend the better part of your day seated in one. Make it comfortable and supportive! When scouting out the perfect office chair, Apartment Therapy advises looking for one with an adjustable height, reclining seat back, armrests, a deep seat depth, proper wheels, and lumbar support. If you have hardwood floors, perk ‘em up with a rug. This rug can either coordinate with your office décor or provide a pop of unexpected burst of color in the room. What better way to know exactly what’s on your agenda than to see it on the wall in front of you? Featured on Brit + Co, this 2017 chalkboard wall calendar allows you to get up and use a chalk ink pen to scribble your to-do list on peel and stick decals. If your desk isn’t already facing a window, switch up its placement with a little feng shui for a different point of view. And now that you’re facing the window, you’ll still need some blinds or drapes to keep the sun from shining too brightly into the room. Start shopping for custom window coverings in pretty patterns, colors, or designs that you’ll love whether they’re open or shut. 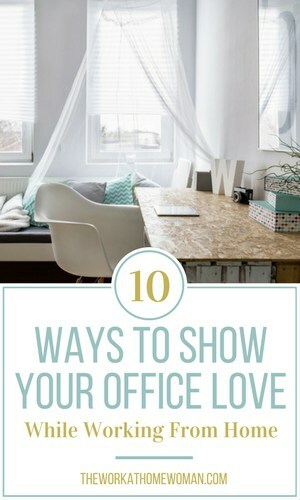 Most #desklove listicles will encourage adding pictures of loved ones and fun knickknacks to your desk to show off your personality in the workplace. But real talk: How often does anyone update these items? Switch up the art and images you have framed on your desk, change the desktop background on your computer, stock up on a cool new notepad, pens, washi tape, and planner, and even look into buying a brightly colored trash basket. You’re just about finished revamping your space! Now, it’s time to put on some music that gets you pumped up for the day and spray a fresh new scent, like orange blossom or lily of the valley, into the air. Leave your pajamas for bedtime and dress for the day as you would if you were going into a slightly more formal office setting. This will help put you in a professional state of mind and ensure that any last-minute Skype or FaceTime calls don’t have you scrambling to throw on a new outfit. Have a small office space or no dedicated office at all? This post has some great tips for revitalizing a small office. How do you revitalize your office? Would love to hear your home office tips below. That is a beautiful space! One thing I did with my home office was paint it a light grey, added a sofa, and shelves to place my travel books. Making my home office comfortable and aesthetically appealing is what helped me up my productivity. Sounds like my kind of room! Very nice article. I just actually put up my curtains a week ago and am facing a window, so I can say it works!!! Thanks for sharing!!! I loved these ideas. Apart from my day job, I also prefer doing work from home and am thinking to redecorate my home-office. This should also be a very useful read for work from home moms. Glad you enjoyed it, Mahesh. Keep us posted on how it turns out. Thanks for the tips! Have a great rest of the week!